All of our valuations for probate are carried out by our team of professional valuers promptly and with the upmost care. We are able to submit a draft by email once the estate has been viewed and a final copy by post by the end of the next working day. Our probate valuations service is used by private individuals and solicitors alike and solicitors references are available upon request. 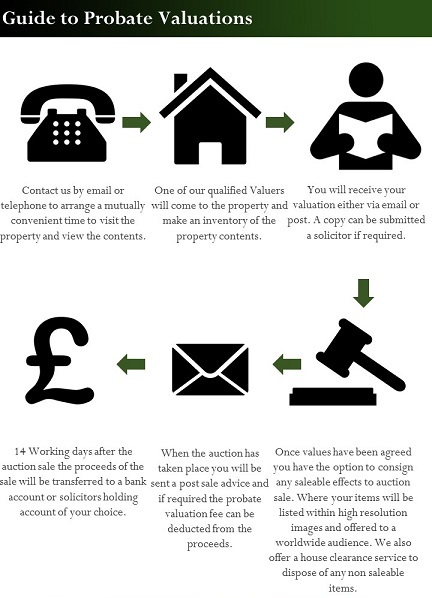 Whilst viewing the estate for the probate valuation we are also able to provide a free no obligation quote for house clearance and can also enter items into auction for you at a later date. We pride ourselves on being able to offer a speedy and sensitive service that can be tailored to the exact needs of our clients. Probate valuations start at £60.00 and If you would like to discuss anything more in detail please contact our probate team on 01268 777122. We also offer probate valuations in Cambridge, London, Suffolk and Kent.